Givenchy is renowned as one of the classic couture houses and is a brand that continues to invent and reinvent both itself and current fashion trends. It is one of fashion's big hitters when it comes to label recognition but this has never stopped the brand from being forward thinking, innovative and inventive too. The aesthetic has encompassed everything from dark romanticism through to geometry and there is always an element of urban couture underlying every look. 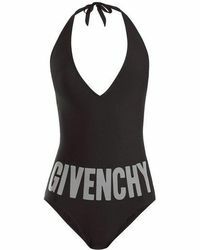 The beachwear range from Givenchy is bright and colourful, offering maillots and bikinis that are cut to flatter and which feature a range of eye-catching prints.